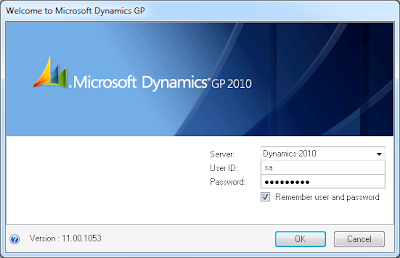 Why does Microsoft Dynamics GP encrypt passwords? I generally don't get into the technical side of GP in the Tip42day but this is just too good not to share. Is there any column that will show the last activity time for a user? I would like to be able to send email alerts to users who are logged in but haven't been active for 1 hour. Urban Legends - "I cracked Dynamics GP encryption algorithm!" It is just about right that I start out this article with the definition of Urban Legend. According to Wikipedia, "An urban legend, urban myth, urban tale, or a contemporary legend, is a form of modern folklore consisting of apocryphal stories believed by their tellers to be true. As with all folklore and mythology, the designation suggests nothing about the story's factuality or falsehood, but merely that it is in non-institutional circulation, exhibits variation over time, and carries some significance that motivates the community in preserving and propagating it." The definition seems just about right for what you will read next. If you are the type who believes everything you read without questioning it, then for your own sake, please stay off the Internet! Rumors -- as they can only be referred to -- began circulating today on claims of someone cracking the Microsoft Dynamics GP user password encryption algorithm -- if you are interested in the original article, click here. Instead of ranting about the misleading content of the article, I will provide my unbiased, fact-based knowledge of the user password encryption algorithm and Microsoft Dynamics GP security. If you open the window with Modifier (or Dexterity) you will notice the Window Title value is ~internal~. The System Setup Checklist is one of those windows. Windows with this title are not available as a security object that can be added to a task. Do we really want Windows Authentication for Microsoft Dynamics GP? Over the years, I have seen many requests for Windows Authentication support for Microsoft Dynamics GP, and I have to say I have mixed feelings about it. In theory, it sounds good, but in practice it may be a threat to your customer's financial information security. Regardless of authentication method, users will still have to select a company to access which defeats the purpose of having a single sign-on. If we have true Windows Authentication, then a workstation left unattended without being locked, could be used to access the financial system without the additional level of security of requiring a login. Also, if Windows Authentication is used, the password will not be encrypted (see article below). Converting Security to v 10 – it’s OK! I’ve heard a lot of buzz about converting security from earlier versions (8 or 9) to version 10. Most of what I have heard is “don’t do it”. I disagree. Do it, but understand the ramifications. The first (and only) ramification I can speak to is that you can get up and running more quickly by converting your current security than by completely re-doing your security using the new v 10 concept. In my world, if my clients had to re-do their security they would possibly never convert. Converting security to the new paradigm for a site with many users and many companies is an onerous task; and that’s putting it in a good light.